Shizu Saldamando has had her work shown at the National Portrait Gallery in Washington, D.C. It has also been a part of a collection at the Venice Biennale and featured at the Los Angeles County Museum of Art. But only once has she had to wear a hard hat and reflective vest for the instillation of one of her pieces: “Artist Educators,” her drawn portraits that sit above the Palms stop on the Metro Expo Line. 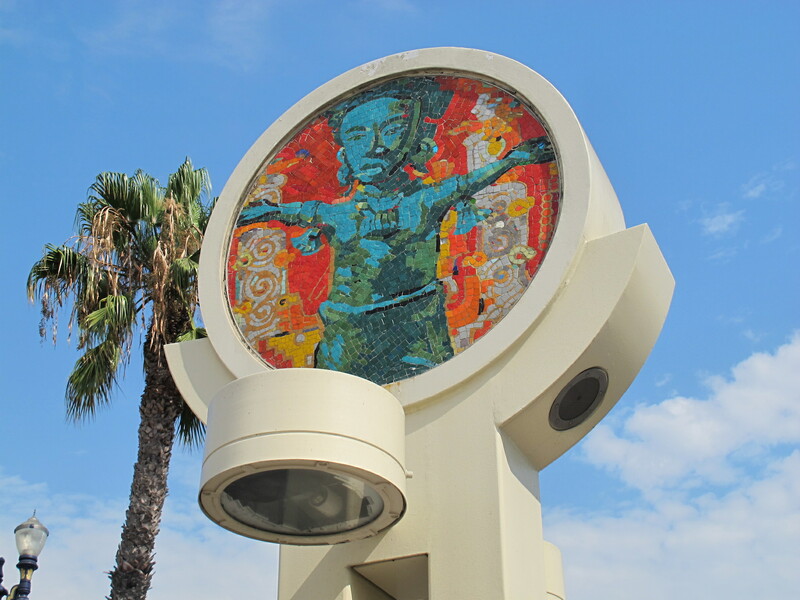 Saldamando is one of a surprisingly large number of artists who have had their work incorporated into the Los Angeles public transit system, with hundreds of painters, photographers, sculptors and others adding a splash of art to morning and afternoon commutes. The aesthetics of the rail stations was such an important consideration for Metro that it made its way into the original proposals for the Blue and Red Lines, going back to the early ‘80s, according to Maya Emsden, the Deputy Executive Officer of Creative Services for Metro. 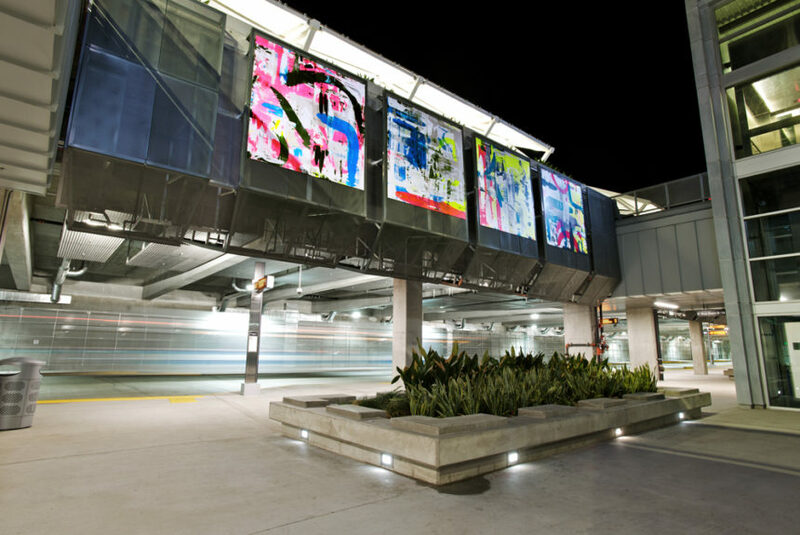 Many of the stations along the Red Line were designed in part by artists; it’s why the stop at Hollywood and Highland, a stone’s throw from the Hollywood Roosevelt Hotel, features columns that seem to “peel” at the top, like leaves on a flower’s stem, while the Vermont/Sunset station, which serves several different hospitals, takes on a medical theme. While the latest station openings are of a more utilitarian, uniform design, art still ties the stops to their surroundings. Sometimes, that can be very literal, as in Jessica Polzin McCoy’s “Neighborhood Portrait: Reconstructed,” featuring paintings of buildings and interior spaces visible around the West Adams community, displayed at the Expo/Vermont station. Others, like Martin Durazo’s “Vamos Juntos/Juntas,” are more abstract – in his case, frenetic swoops of color that represent the energy of the city, one Durazo told an audience at a Metro Art talk that he remembers as a hub of punk music during his youth. 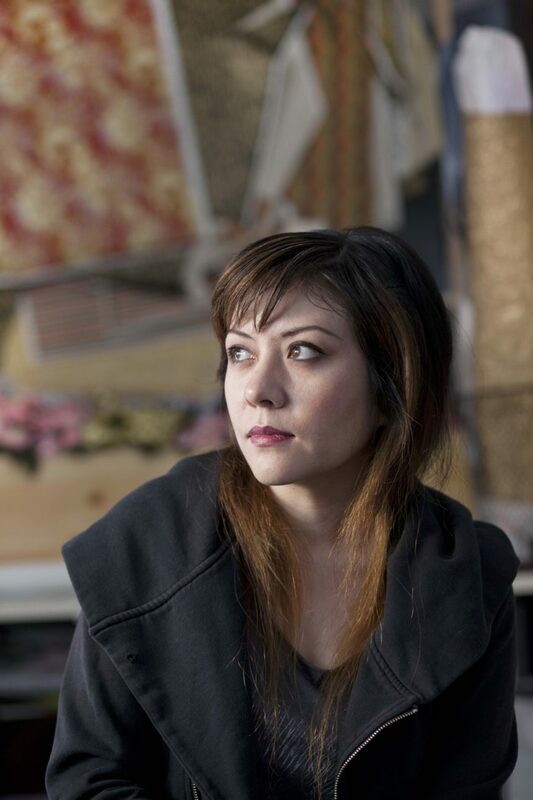 For “Artist Educators,” Saldamando found inspiration in her family’s history (many in her family settled in the West LA area after imprisonment in Japanese internment camps) and the dual life that so many artists must live in order to make a living. Her drawings, done on wood and then transferred to tiles painted to look lumber-like by a fabricator in Munich, capture some of these area faces: artists that make up the fabric of the community. 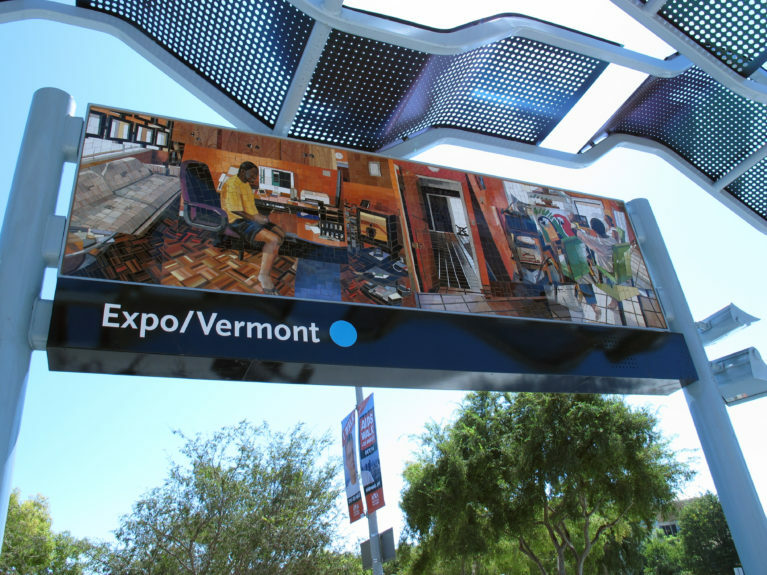 And those drawings can be seen by everyone in the neighborhood, as well; like many of the pieces along the Expo Line, “Artist Educators” is visible from surrounding streets. And for some of the artists, that connection to a neighborhood and to people who may not be dedicated gallery-hoppers has changed their work going forward. Carmen Argote, who created “What You Wore, What You Wear” for the 17th St./Santa Monica College stop, stepping out of her studio and creating public art has made her think more about the destination of her own work.